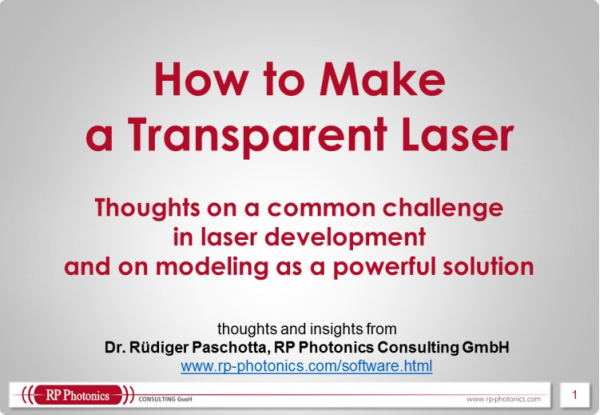 Ask RP Photonics for advice and calculations concerning the properties of cavity modes. 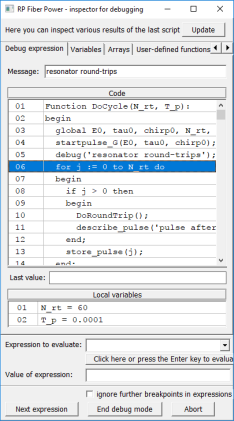 For example, the powerful numerical software RP Resonator is ideal for laser resonator design. Resonator modes are the modes of an optical resonator (cavity), i.e. field distributions which reproduce themselves (apart from a possible loss of power) after one round trip. They can exist whether or not the resonator is geometrically stable, but the mode properties of unstable resonators are fairly complicated. In the following, only modes of stable resonators are considered. In the simplest case of a resonator containing only parabolic mirrors and optically homogeneous media, the resonator modes (cavity modes) are Hermite–Gaussian modes. The simplest of those are the Gaussian modes, where the field distribution is defined by a Gaussian function (→ Gaussian beams). The evolution of the beam radius and the radius of curvature of the wavefronts is determined by the details of the resonator. As an example, Figures 1 and 2 show the Gaussian resonator modes for two versions of a simple resonator with a plane mirror, a laser crystal, and a curved end mirror. For a more strongly curved end mirror (Figure 2), the mode radius on the left mirror becomes smaller. Figure 1: A simple resonators and the electric field distribution of its Gaussian mode. The wavefronts must be plane on the flat left end mirror, and the beam radius on the left mirror is so that the wavefronts also match the curvature of the right mirror. Figure 2: Same as in Figure 1, but with a stronger curvature of the right mirror. The mode field adjusts accordingly. In addition to the Gaussian modes, a resonator also has higher-order modes with more complicated intensity distributions. At a beam waist, the electric field distribution can be written as a product of two Hermite polynomials with orders n and m (non-negative integers, corresponding to x and y directions) and two Gaussian functions. (We still assume a simple resonator with only parabolic mirrors and optically homogeneous media.) These modes are also called TEMnm modes; the article on higher-order modes describes the exact mathematical form. The optical intensity distribution of such a mode (Figure 1) has n nodes in the horizontal direction and m nodes in the vertical direction (Figure 3). 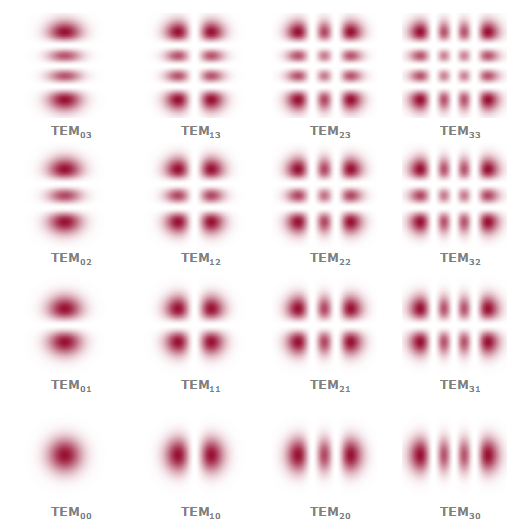 Figure 3: Intensity distributions of TEMnm modes. where φG is the Gouy phase shift per round trip. The magnitude of that Gouy phase depends on the resonator design. Figure 4: Mode frequencies of an optical resonator. The free spectral range Δν corresponds to the distance of blue lines, and δν is the spacing of higher-order modes (of which only four with low orders are shown). Due to chromatic dispersion and diffraction effects, the mode spacings actually have a (weak) frequency dependence, which, however, is often not of interest. Resonant enhancement, e.g. 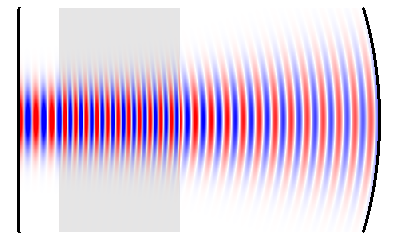 of an incident light wave, hitting a partially transmissive mirror of a resonator from outside, is possible within a range of optical frequencies. The width of that range is called the resonator bandwidth, and this quantity is determined by the rate of optical power losses. For certain values of the Gouy phase shift, mode frequency degeneracies can occur. In a laser, these can lead to a strong deterioration of beam quality by resonant coupling of the axial modes to higher-order modes. With proper resonator design, it is possible to avoid at least the particularly sensitive frequency degeneracies and thus to improve laser beam quality . Such degeneracies also can have useful properties; e.g. when a Fabry–Pérot interferometer is used as an optical spectrum analyzer (spectrometer), precise adjustment of the mirrors (e.g. in a confocal configuration) allows the use without mode matching. Also, degenerate cavities can be used for Herriot-type multipass cells, which can be used e.g. for strongly increasing the round-trip path length in a laser resonator without changing the overall resonator design. Laser oscillation usually occurs with one or several frequencies which correspond fairly precisely to certain mode frequencies. However, frequency-dependent gain can cause some frequency pulling (slightly nonresonant oscillation), and the mode frequencies themselves can be influenced e.g. by thermal lensing in the gain medium. Single-frequency operation of a laser means that only a single resonator mode (nearly always a Gaussian one) is excited; this leads to a much lower emission bandwidth than in cases where multiple resonator modes are excited. Pulse generation with mode locking can also be explained in terms of resonator modes; in that case, several or even many fundamental modes are simultaneously excited, with a fixed (“locked”) phase relationship of the corresponding fields. Under such conditions, a periodic pulse train is emitted by the laser. When a laser has a poor beam quality, this is usually (although not always) the result of the excitation of higher-order transverse cavity modes. Note that it is important to distinguish coherent and incoherent mode superpositions, which can have very different properties. 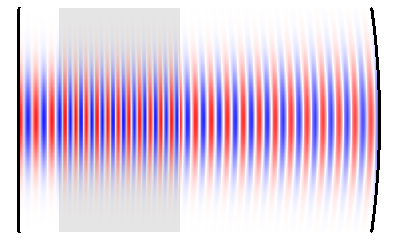 If different modes of a laser resonator are simultaneously excited, there is usually the phenomenon of mode competition. Modes of laser resonator can differ significantly from those of an empty resonator, because they are subject to transversely varying gain and loss. This not only results in some deformation of the spatial shape; it is also that the resonator modes are no longer mutually orthogonal. Instead, there is a set of adjoint modes, related to the actual resonator modes by some biorthogonality relations. This biorthogonal (non-normal) nature has a number of peculiar implications. For example, the total power circulating in the laser is no longer simply the sum of the powers propagating in the different modes. There are also effects on the laser noise.